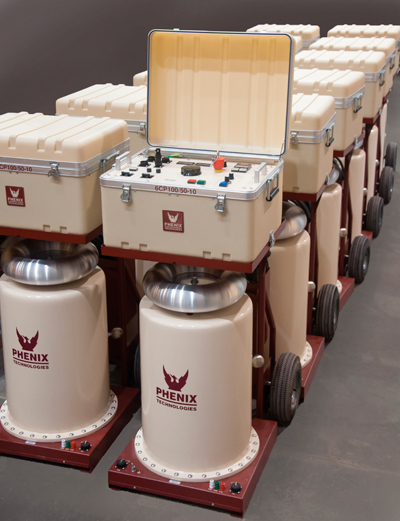 Phenix Technologies offers a premier line of mobile AC Dielectric Test Sets with ratings from 15-200 kV suitable for dielectric testing a wide range of electrical apparatus. All units in the 6CP line consist of a control and regulator enclosure and a separate high voltage section. The system is equipped with advanced digital metering, and control and protection devices which are easy to use and provide the operator with all necessary information to safely operate the system. The Metering Guard Mode allows accurate measurements of the high voltage test specimen leakage current by bypassing stray capacitive currents. The high voltage section consists of a specially designed oil insulated high voltage transformer with isolating cylindrical housing mounted on a rugged steel base. The high voltage output is equipped with a corona free aluminum shielding electrode. 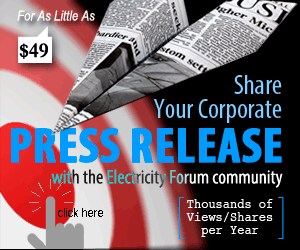 The high quality design and construction is key to the superior partial discharge performance of the 6CP line. The system arrives ready to use with all power and interconnect cables included; the simple setup allows this 6CP to be ready for testing in minutes. The rugged construction and dependability, backed by long-term warranty makes the 6CP line an ideal choice for your high voltage testing requirements.